We have already written an article about the watermelon. Now the latest frequent news of poisoning of watermelon has made us to return to this theme once again. The increasing number of cases of poisoning of watermelon and melon which has left at least one girl dead has caused deep concerns among population. The first signs of poisoning of watermelon appear within a few hours after eating: Fatigue, severe headache, nausea, vomiting and diarrhea; in some cases the temperature, cramps and aches in the joints. The signs of toxic watermelon are as follow: Yellow fiber pulp, glossy, like polished, slice, purple hue of the pulp and sour smell. You can even check yourself a watermelon for the presence of nitrates, mashing a piece of pulp in a glass of water. If the water turns red this is the nitrated watermelon. If the water just turbids that means it is the good one. So, what is the situation in Azerbaijan's bazaars? What is the sale of a watermelon and how sellers determine the toxic watermelon? Searching answers to our questions, we visited the most popular bazaar among Azerbaijan's population, Yashil bazar. Approaching to a seller, first of all we asked the cost of the watermelon. Answering that it is 20 copecks for a kilo, he began to praise his product. "This watermelon is from Sabirabad. I grew it and now sell it myself. You will not regret," the seller said. Then, we asked him how he can distinguish organic watermelon from non-organic. Saying that he spent about 6-7 years in this job, the seller revealed the main points in choosing the right watermelon: green stalk is an indicator of freshness of a watermelon. Another way of determination is cutting off a watermelon. If it divided at once, the watermelon is fresh. However, we warn you not to apply the last item, as by doing this, with unsterile knife they not only enter bacteria into the berry but also the chemicals located on the surface, by which they were fed. Meanwhile, a consumer came and asked to weight a watermelon. Then, he wanted the seller to cut the watermelon to ensure the quality. The seller cut it off and, then came the moment of truth. The watermelon did not cleave, as the seller noted before. Another seller said that in order to check a watermelon for freshness it is enough to flick it. If you hear a sound from it that means the watermelon will not harm you. 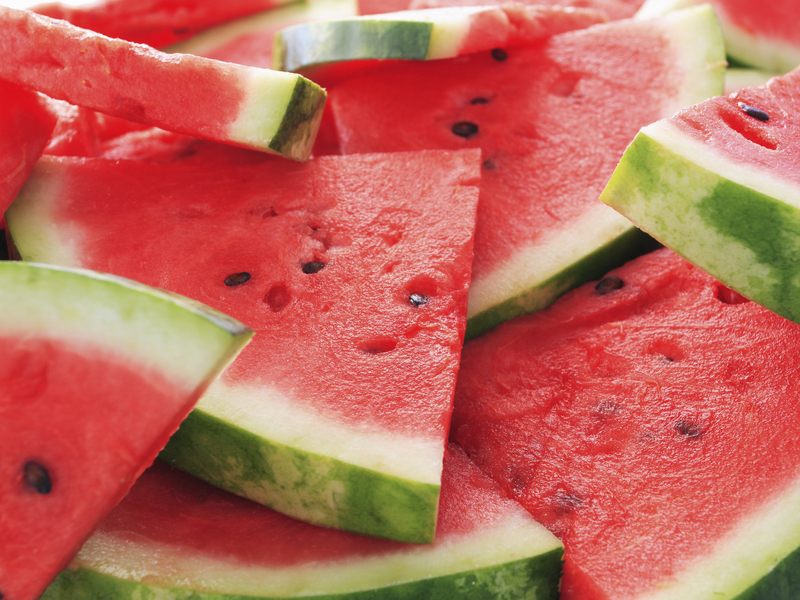 The quality of watermelon must be without bruise and yellow spots on it should be as few as possible. We were also curious of consumers' opinions. A woman who hesitated purchasing a watermelon noted that she was poisoned by a watermelon for two times. "Suffering from allergy I went to the doctor and he said that this is the caused by eating watermelon." Saying that she loves watermelon a lot, the woman hesitated to buy it again. Professor Adil Geybulla said that it is important to drink a lot of water in the case of intoxication being affected by a watermelon. "Especially, women, children and older people should stay away from these fruit and vegetables. Sometimes it is impossible to determine the state of intoxication." he said. "In this case, it is important to drink a lot of water. Then it is necessary to call a doctor," he noted. "It is better to consume fruits and vegetables in the season. Fruit and vegetables grown by fertilizers, of course are very dangerous," he said. "Such fruit as tomato and watermelon, which contain a lot of water absorb all harmful fertilizers and thus have a devastating impact on human body," Geybulla said.